Thank you EVERYONE who supported Ignite Annapolis 4. It was a banner evening and we could not have done it without you. Our videos are ready to watch here! Feel like you were there with us when you watch this live stream…special shout out to Carlin Timm, who provided musical entertainment prior to the show and our wonderful emcee Rob Timm of WRNR. Get Ready for Ignite Annapolis 5! GET ON NEXT YEAR’S LIST NOW! Stay tuned and be the first to know about Ignite Annapolis 5! At Ignite Annapolis, 16 artists, technologists, thinkers and personalities had 5 minutes and 20 slides to spark new conversations and collaborations across cultures and disciplines. Ignite is a geek event in over 100 cities worldwide. At the events, Ignite presenters share their personal and professional passions, using 20 slides that auto-advance every 15 seconds for a total of just five minutes. The event is produced in partnership with Annapolis-based non-profit The Friends Foundation and proceeds will benefit The Capital Gazette Memorial Scholarship Fund benefiting students of the University of Maryland’s Philip Merrill College of Journalism. Receive top visibility and exposure to an innovative and dynamic community of thought leaders, artists, techies and entrepreneurs. Do you have a message to the universe (or at least Annapolis) you would like to share? Enlighten us. Join our team of volunteers in recruiting for submissions, coaching presenters, sponsorship outreach, and more! 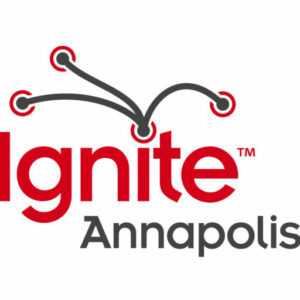 Join us next year for Ignite Annapolis 5 Spring of 2020! Dunkin Donuts 38 West St.
Be the first to know…sign up for our newsletter!